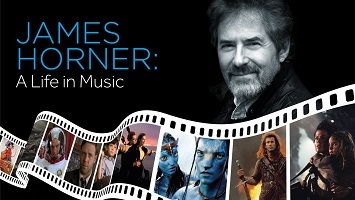 Presented as part of the Royal Albert Hall’s Festival of Film in London, on 24 October 2017 was what was billed as the world premiere of James Horner: A Life in Music (though quite what entitled it to be designated a world premiere given exactly the same programme and audiovisual elements had been presented in two concerts in Switzerland a month earlier, I’m not sure). The Cinematic Sinfonia conducted by Ludwig Wicki was joined by the Crouch End Festival Chorus and various soloists for the evening. I was privileged to be present at the first major concert dedicated to Horner’s music, in Vienna in 2013, and that remarkable evening showed (as if there were any doubt) that Horner’s film music works exquisitely in a concert hall setting. With his focus on emotion coupled with his phenomenal compositional technique, he was a one-off film composer, having a different approach from anyone before or since in the way he coloured films, the way he saw his work as a single large canvas, and that phenomenal array of music means you could pick from an almost endless list of possible pieces to perform in concert and come away with something special – that said, there were some surprises in the programme, which made an admirable attempt to go beyond the predictable “greatest hits” into slightly more unexpected territory, though it didn’t always succeed. In between most of the pieces came interview segments with some of the composer’s most notable collaborators. Despite his rather dishevelled appearance (more beard than man really, a pair of bloodshot eyes stuck on a woolly sheep) Mel Gibson made the most interesting observations, with the others offering up rather blander platitudes, though James Cameron was at least very witty at times. It was Horner himself seen first on screen, starting the first half of the show with a memory of what made him want to write music (it was the first time he heard Beethoven’s Seventh); then the music got underway with the very brief Universal Fanfare from the early 1990s. Someone once contacted me to say they were putting together a film music concert in London and asked me if I’d be interested in helping in some capacity. I enthusiastically encouraged them to play Krull (among other things). Evidently this wasn’t an acceptable suggestion because I didn’t hear from them again and I thought I would never hear this great film score in concert. Yet here I found myself, listening to a 95-piece orchestra play Krull in possibly the most iconic concert venue in the world… and what piece did they choose to play? Surely it would be the rousing masterpiece “Riding the Fire Mares”, that most thrilling of cues… no? Hmm, then maybe they’re looking for something more romantic, so perhaps it’s the outrageously beautiful “Colwyn and Lyssa”? Oh no wait, they’ve picked an action cue – it must be “The Death of the Beast and the Destruction of the Black Fortress”! How exciting! No, none of those – it’s “Battle in the Swamp”. Whoever made that decision is forever stricken from my Christmas card list, but still – it’s a decent enough piece – and I did finally get to hear something from Krull in concert. After that, the first half was uniformly wonderful. Concerns had been raised in advance about the suite from Apollo 13, with liberties taken by the arranger, but it sounded perfectly fine to me, a combination of the main title and the rousing “Re-entry and Splashdown”; then a real treat, with “The Flying Circus” from The Rocketeer, a spectacular action cue played in full. It’s that rousing, spirited score in a nutshell really, and Wicki enticed a stunning performance from the orchestra. The main title from Star Trek II followed (I’d rather have the end title, with its rousing conclusion) – at the opening of the piece, with the spooky sounds, two chaps in the percussion section were waving long fluorescent tubes about over their heads, which got a laugh from the audience (I thought how pleased their parents must be that they spent tens of thousands of pounds sending their kids through the Royal College of Music or something, to see them get to stand on stage waving a rubber tube about). An absolute classic followed this, “The Ludlows” from Legends of the Fall, obviously one of the composer’s most beautiful pieces and it was received with a kind of religious fervour in the hall (the closing section with the violin duet accompanied by piano was truly stunning). In contrast with this was the spectacular suite from Aliens, combining the main title with part of “Bishop’s Countdown” – the latter part in particular is unbelievable live. The theme from Iris was next, with a fine solo violin performance by a strangely-uncredited soloists, who only appeared on stage for those three minutes. After that, Mel came back on stage to talk about Braveheart, and the suite performed afterwards was simply incredible – “For the Love of a Princess”, with its heart-melting harmonies and stunning melody, is clearly one of the finest love themes the cinema’s ever heard, and following this was the moving “Freedom / The Execution / Bannockburn”. The orchestra was joined by Eric Rigler, one of Horner’s frequent instrumental collaborators, who played the whistles and pipes – and the suite brought the house down, undoubtedly the highlight of the evening and ending a first half which sent frequent shivers down the spine. The second half was decent, but didn’t live up to the first, thanks mostly to some rather odd programming decisions. First up was the lengthy suite from Titanic, billed as the “Avex Edition” (I’m not entirely sure what that means, but I guess it means it was created especially for this show). Parts were great – Rigler again with his pipes and whistles, Clara Sanabras with the solo vocals, late in the suite the powerful action music from later in the film – but did we really need the non-Horner Irish stuff in the middle? And bizarrely, after a heavily-abridged version of “The Place Where Dreams Come True” from Field of Dreams, we were back to Titanic again as Sanabras returned to the stage for “My Heart Will Go On”. Surely it would have been better to dump the wordless arrangement of the song which closed suite and put this there instead, if the song had to be included? Sanabras stayed on stage to perform the wordless vocals for “A Kaleidoscope of Mathematics” from A Beautiful Mind, a beautiful piece given a really pacey, punchy rendition; then she was replaced by a different vocalist, Alice Zawadzki, for a lovely take on Horner’s sweetest (and perhaps best) song, “Somewhere Out There” from An American Tail. Quite a contrast followed, with the chaotic “A Call to Arms” from Glory – a complex, demanding piece for the orchestra – given a really impressive performance. Oddly, Wicki didn’t pause to allow applause at the end of it and launched straight into “The Ride” from The Mask of Zorro, a fine and fun piece but probably not the one I’d pick to play from that score. The programme ended with something I had been looking forward to all evening – the suite from Avatar. Having heard it in Vienna, I knew just what to expect, and it would bring the house down. Eric Rigler was back, playing all sorts of different wind instruments, but as it went on it became clear that actually I hadn’t known what to expect after all – I should have been warned by the reappearance of the “Avex Edition” suffix because this was not the suite that was performed in Vienna (and has been performed elsewhere) and didn’t feature the stunning “War” which would have knocked the roof off the hall. It was fine and everything, and if I’d never have heard the other one I’d probably have had a massive grin on my face when it ended – instead I thought “is that it?” which is a shame. The encore was, rather oddly, a reprise of A Beautiful Mind (they surely could have done a different piece – and if they were going to repeat one, that’s not the one that would spring to mind) and it brought to a close a concert that was a fine showcase of this incredible film composer’s range and talent – and one which, despite the few critical comments above, I thought was in general spectacularly good. It just needed those few little tweaks – play the right track from Krull, shorten the Titanic suite, play the right Avatar suite, have a proper encore (preferably The Flying Horsemen) – and it would have been a night that nobody present would ever be able to forget, much like that night in Vienna four years earlier. It wasn’t quite that, so hopefully the producers do make the changes (they really should speak to me before doing this sort of thing!) before it goes out on the road and starts appearing around the world, which I assume is the plan. But really – it was a hell of a concert anyway. If it does come near you, go and see it – there are guaranteed goosebumps for fans of this remarkable composer. Excellent report, James, glad you almost enjoyed it! Have to agree with you the Braveheart suite was magnificent . I enjoyed reading you thoughts thank you. Thanks for the report, James! I was also present in Vienna in 2013 and that was an unforgettable evening for sure. The only thing I missed there was a longer piece from my favourite Horner score, Braveheart. It seems that now they included a much longer piece, actually, two pieces from that score. Great! I couldn’t go to London for this concert but I really hope that you’re right and it will be a concert tour. I’d like to hear the music of Horner played live again.